Back in 2013, Pope Francis revealed that if he had one miracle to perform, it would be to heal children because it pains him to see them suffer. 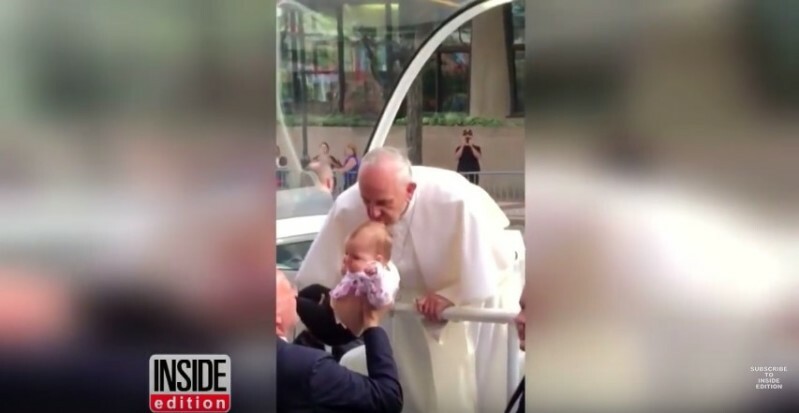 And the Holy Father must have been happy that at least one little girl was making an amazing recovery after he kissed her on her head. Gianna Masciantonio was born in 2014 with an extremely rare blood disease that caused a tumor in her brain. Desperate parents took their baby daughter for chemo, but they were still extremely worried, as doctors gave them no hope. So, when Pope Francis was in their home state, an FBI agent helped the family by getting the Holy Father’s attention. Without knowing the girl’s tragic story, Pope gave her a kiss on the head, just centimeters away from the tumor. And then it was time for miracle! Over the next few weeks, Gianna had 2 sessions of chemo. Soon, they did an MRI that showed that her tumor was barely visible! Now, 3 years later after the kiss, the family reveals it’s gone, and the girl is doing great, and she's looking forward to attending preschool. That kiss meant more to my family than anyone could ever imagine. I think Pope Francis is a living saint and to us, he gave us a sign that God has been with us through this entire journey. Sounds like a clear case of publication bias to me. Why no mention of the hundreds of other sick babies he kissed who died afterwards? Maybe doctors and nurses and oncologists had something to do with it?